Whats the idea behind this build? I was playing this build https://www.pathofexile.com/forum/view-thread/2459778 but Divine Ire didnt really appeal to me and one day I thought that Lightning Tendrils should work great in this setup - combined with Orb of Storm, which should be clearing quite well. And hell yes, it turned out to be absolutely amazing. Some words on the costs of the build: To get this build uber elder viable you should invest about 5-8ex I think. Although I think you can play this build on low budget too, I won't cover this in the guide tho. We use Lightning Tendrils as our sinle target skill. Orb of Storm provides us permanent Onslaught and Innervate while on the same time clearing multiple screens. The overall clear speed can easyly compete with Winter Orb. The damage is coming from the non-chaos added as extra chaos damage/ ele-conversion mechanics provided by the trickster ascendancy. The Perfect Form body armour and Tricksters Ghost Shrouds provide us all the tankyness that is required. In the following sections I will cover my mapping and single target set ups. The latter of which I am only using when facing Uber Elder, so there is NO constant gem/skill swapping! I will also show you the "normal" version which should be used until you have all your gear and gems maxed out and before you start running high tier maps brainlessly. - Call of the Brotherhood: With two of them we convert 80% of Lightnig damage to Cold, but why is that usefull? When it comes to "non-chaos damage added as extra chaos damage" the game counts the full amount of lightning damage before the conversion to cold and the converted cold damage. So 100% of lightning damage and 80% of this value will be added as extra chaos damage. Example calculation: Admit that your spell deals 100 lightning damage. 80% of it are converted to cold. You deal now 20 lightning damage and 80 cold damage. Result: 90 chaos damage + 20 lightnig damage + 80 cold damage = 190 damage. As we don't play with physical dmage it doesnt matter. We could convert some cold damage to fire damage with the Cold to Fire gem , but according to PoB it isnt as benfetial as using the bis gem. - Swift Killer (Trickster Ascendancy): 100% increased damage and easy access to 4 Power and Frenzy charges. - Mind over Matter and Eldritch Battery (Skill Tree): Mind over Matter makes that 30% of damage is taken from mana before life, while Eldritch Battery makes our energy shield protect mana instead of life. This way we can make use of 1 Aura and 2 Heralds! And yeah, it also reduces damage taken by 30%... We could actually use 2 auras, Wrath would be the second one in this case, but it only adss a little bit damage. I rather keep the heralds. - Ghost Dance (Trickster Ascandancy): 5% evade chance, 9% reduced damage taken and a ghost shroud per second up to maximum 3. - Ghost Shrouds: they do not only reduce damage taken and increase our cast speed, but when you loose one (which you do when getting hit) you automatically get 5% of your evasion rating as energy shield back. That basicly means that you immediatly regen about 1000 ES on hit!!! - Escape Artist: converts evasion rating from our body armour to ES! That provides a solid amount of ES. Next to this you should try to get combined 250 ES from your gear, at least 150! - Evade Chance: Some incr Evasion Rating from the Skill Tree, some evasion rating from our Chest and Helmet (due to Escape Artist) and Jade Flask result in a bit more than 60% Evade Chance! - Escape Artist and The Perfect Form + Atziris Spep: 66% Spell Dodge Chance! - life leech from Atziris Promise , but only when its active! - be aware of the fact that stacking multiple sources of life leech doesnt make sense, 0.4% of damage Leeched is enough, higher numbers won't make you leech more. The only thing to look for is constant leech for all situations. -> all of this combined we somehow manage to sustain our life pool, but it really doesnt feel that great, thats the best we can get tho! Duskdawn - Provides a bunch of damage and attack block chance. It's definitely the bis unique. 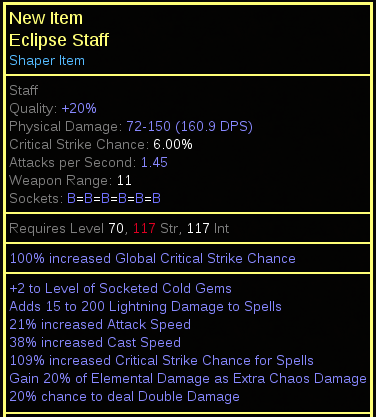 You can use a well rolled rare staff until you get a Duskdawn as it is quite expansive. I chose a staff as we can get all the needed colors on it much easier than on the body armour. Having 5 blue sockets on a high dex base is pretty cost heavy. The staff also grants attack block chance. If you manage to get the requiered colors on your body armour you can decide if you want to go for rare shield/Light of Lunaris and a wand or just two wands. The latter would grant even more damage than the staff version with good wands (two of those are even more expansive than one Duskdawn), and the shield version would be a bit tankier and easier to gear for, with the weakest damage. The Perfect Form - Best option here, it provides all the defenses we need. Spell evade chance, energy shield and physical mitigation. The only downside is that its very difficult to get the correct colours, which is why I chose to use a (int based) staff. Rare Helmet - Look for one with 2 of the following 3 gem mods: Hypothermia, Innervate or Incr Aoe support. Only one of them is ok for the beginning. These mods are mandatory. Next you should look for as much as possible ES (we get more evasion rating this way too). If you can get this Helmet plus a good life roll -> GREAT! If not, just take one with these mods and some resists. I wasnt able to find one with all I need and life. Instead I got one with +1 crit chance, which is amazing too. We will be using our Orb of Storm in this Helmet if you havent noticed yet. Atziri's Step: Almost mandatory as it gives us all we need but resists... Try to get the leech enchant on it, shouldn't be that expansive. 2x Call of the Brotherhood. Explained in the In-Depth Offense explanation. We get some resists here too. A big damage bonus is the Zealotry Watchers Eye that grants Arcane Surge, I highly recommend getting one! don't forget to quality up your flasks!! I recommend to swap the Quicksilver Flask for Bottled Faith when facing Uber Elder tho. As already mentioned I initially started this char as a Divine Ire Trickster and swaped to Lightning Tendrils when I was level 93. Therefore I cannot provide any first-hand Lightning Tendrils leveling information. Still I think that leveling with the endgame set up (LT and OoS) should be pretty easy and effortless. In this section I will just give you some generell leveling advice, you can skip this if you are a advanced player as you can basicly level with whatever spell you want. Swap to two Axiom Perpetuum Sceptres at level 10. If you have any ,ana problems use a Praxis Ring. Use this set up until you reach Act 6, take Lillys Quest - clear the Twillight Strand. Now got to the trade site of your choice and buy better gear. Get your resists to 75%, get some life and energy shield. Now check PoB for the best Lightning Tendril support gems. You can now also buy all other gems that you want to use (cwdt+immortal call for example). Use this set up until you finish the acts. don't forget to gt your Ascandancy Points as soon as you reach the recommended level. Do maps until level 70, again, buy some gear. Depending on your budget you can already buy the bis items now. As soon as you complete the 3. Lab you can swap to MoM and EB. I know that "guide" is pretty rough, but atm I cannot give better advice. If you somehow struggle and don't knwo what to do just look for any caster leveling guide, they easily apply to this build as well. The guide is done now. I hope you will enjoy it. If it is still lacking any information or if you encounter any logical issues please let me know. I will post the change log in this comment if there are any changes. Can you do well with 5L? Sure, you can. For Uber Elder it would be nice to have a 6th link but for all other content you can go with a 5 link.